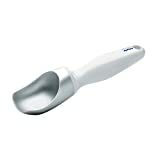 This heavy, sturdy scoop has a superior design which makes it well-equipped to dig into even the hardest frozen confection-be-it ice cream, sorbet or frozen yogurt. The scoop shape also creates and appetizing presentation. Non-slip, ergonomic handle keeps hands out of the cold and free from strain. Plus, the handle is treated so that it will not yellow with age.